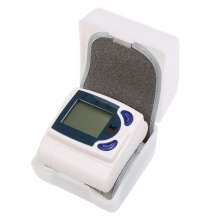 This advanced blood pressure monitor comes with a large screen display and easy controls for effortless day to day use. It also measures heart rate with an added irregular heartbeat indicator. Safe to use for people of all ages. This blood pressure machine is comfortable, portable, and most importantly provides accurate results. 60 store groups memory measurements. Large-scale digital LCD screen, Easy to Read the data. Intelligent automatic compression and decompression. It is compact and easy to store. Best for home and travel use. To Strap the cuff snugly around your wrist. Sit up straight and prop your elbow on a table to help keep it still. Position your wrist so it is at the same level as your heart. Press the power button and avoid unnecessary movements while taking your BP.